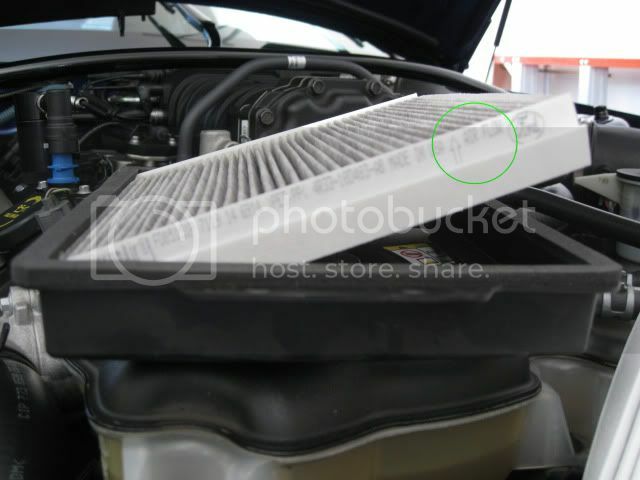 Ford's normal maintenance schedule says you should replace the cabin filter every 15,000 miles or as required for special operating conditions (dusty conditions, off-road, commercial use, etc). Here's how I changed the cabin filter on my 2007 GT500. Cabin Filter Element. 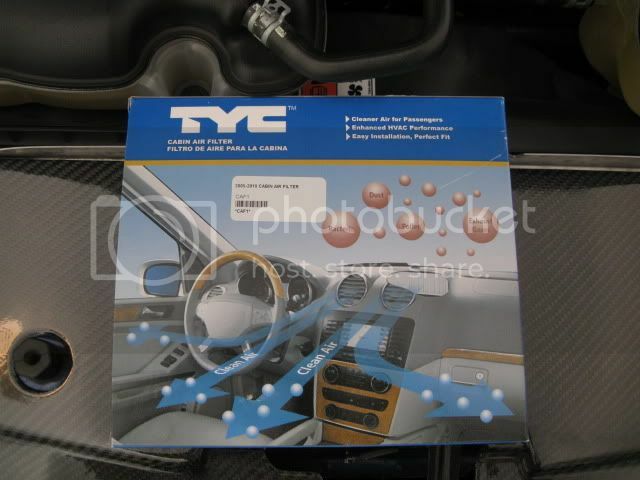 You can buy a Ford Part or an aftermarket such as TYC. I gave the TYC filter a try ... Part Number 800022P. 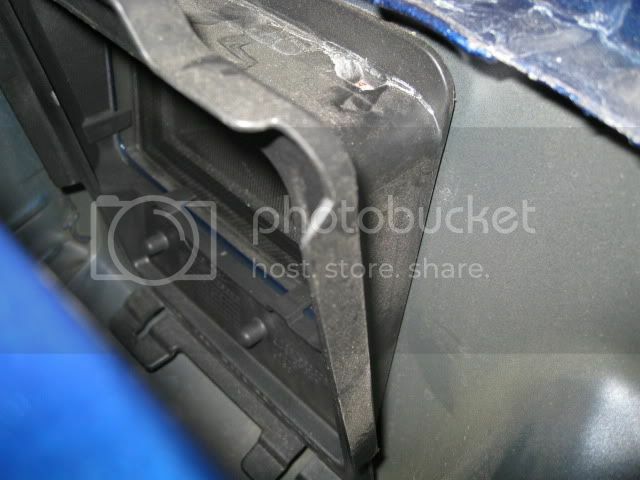 The cabin filter is installed under the passenger side cowl vent screen and is accessible from under the hood. 1. 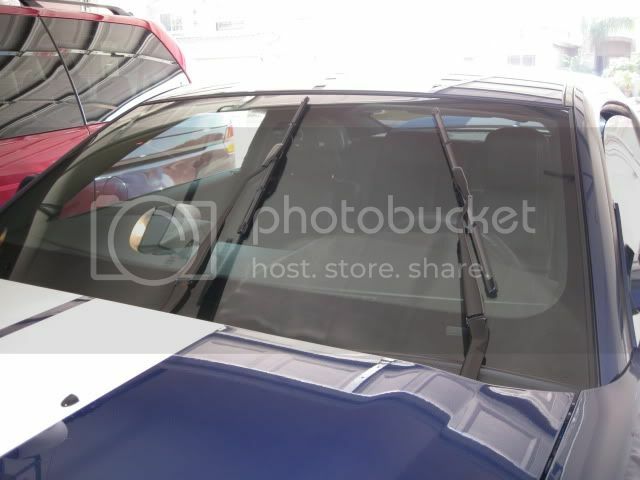 First move the wiper blades out of the way by turning the ignition to ON and pulsing the wipers, turning off the ignition when the wipers are out of the way. 2. With the Phillips screw driver remove the center plastic screw on each of the two cowl push pins that secure the passenger side cowl vent screen. 3. Remove the two cowl push pins. 4. Lift up on the cowl vent screen to release the four anchor pins that secure it in place; there's no need to remove the entire vent screen, just lift it up enough to gain access to the filter. Here are the anchor pins and the slots they fit into. 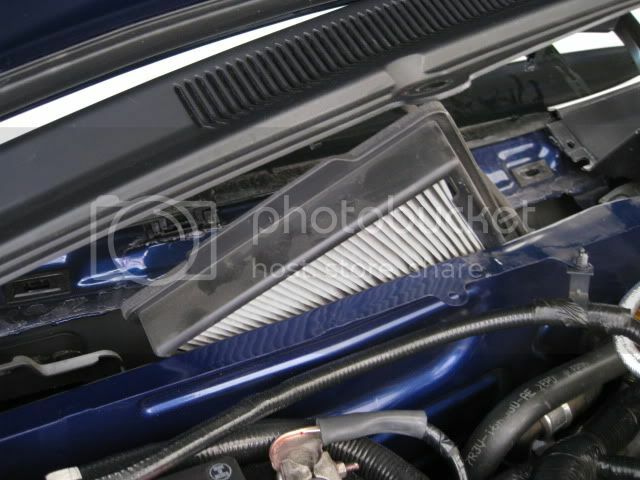 The cabin filter element fits into a plastic frame that secures onto a holding tray on the cabin air intake. It is in the area right behind the battery. ... and lift to remove the filter from under the cowl. Slide the filter towards the driver's side if more room is needed. 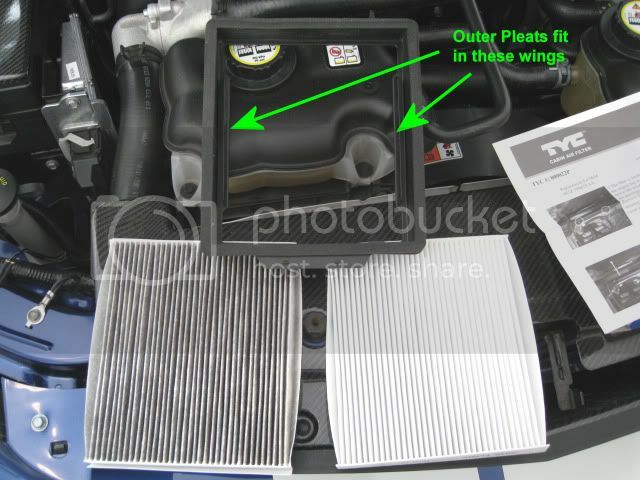 Here's the holding tray on the air intake with the filter frame removed. 6. My filter looked pretty dirty ... on both sides after only 9000 miles. 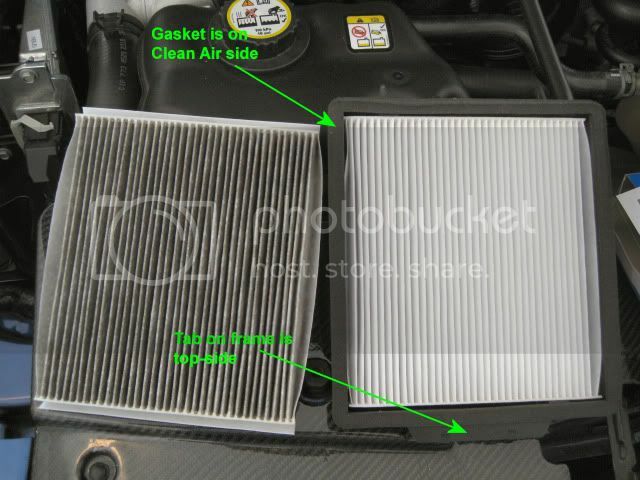 Remove the old filter element from the clean air side of the frame (side with gasket). Note the filter element is directional with an arrow showing direction of air flow. 7. 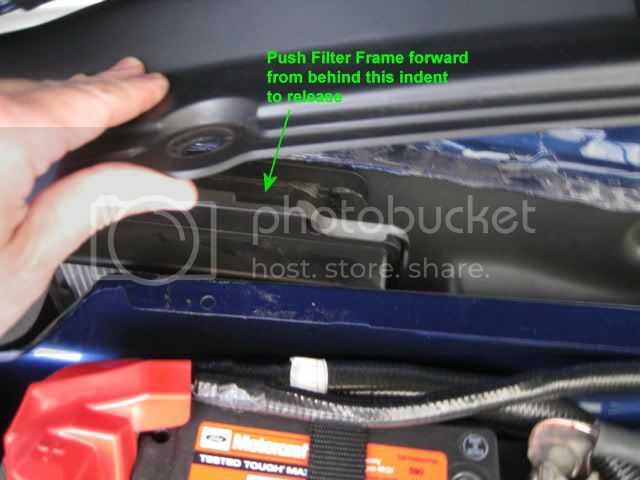 Wipe clean the filter frame and install the new filter element in the frame oriented with the airflow arrow pointing towards the gasket side of the frame. Make sure the outer pleats fit into the wings on each side of the filter frame shown below. I liked how the Ford OEM filter element fit in the frame better than the TYC. The OEM element has flaps on the top and bottom to form some sort of seal that is missing from the TYC element, the OEM element also had a tighter fit in the frame, which I like. The filter frame is now ready to be re-installed. 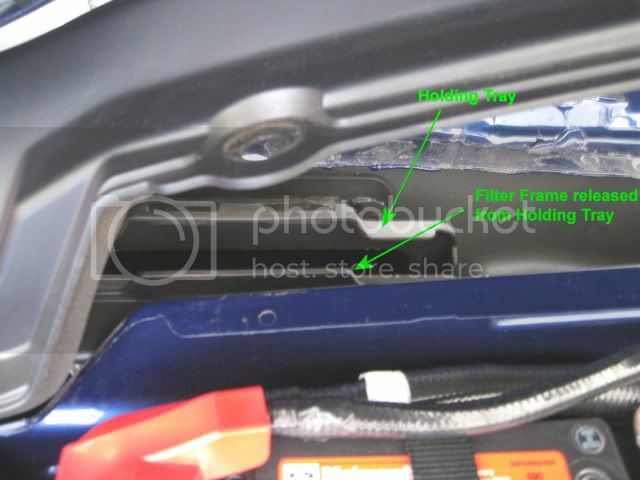 The photo below shows the frame tab that must be oriented up. The gasket is on the clean air side of the frame and faces towards the rear of the vehicle. 8. Before re-installing the frame, inspect the water drain grommet in the well under the cowl to see if it is plugged up by debris. 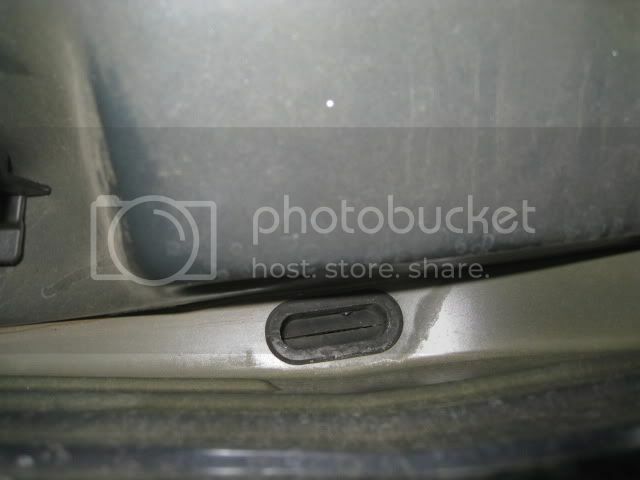 If it is plugged, water can fill up in that area and eventually drain into the cabin via the air intake. Remove any accumulated debris in the well. Mine was pretty clean. 9. Re-install the filter frame to the holding tray and snap it back in place over the air intake. The photos in step 5 and step 7 show how the filter should be oriented during installation. 10. Re-secure the cowl vent screen making sure each of the four anchor pins snap in place (see photo under step 4). 11. 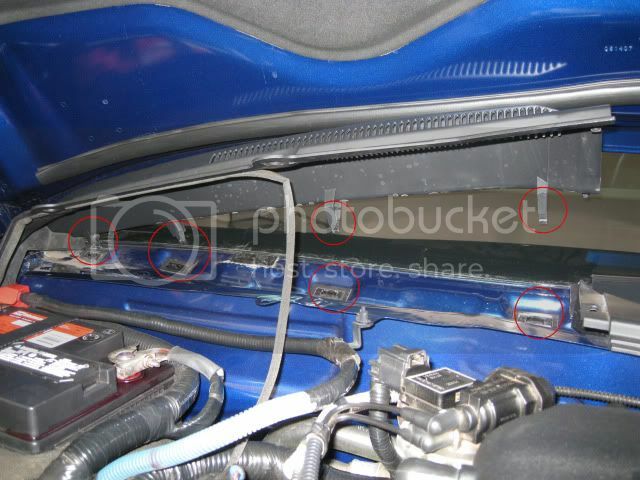 Replace the two cowl push pins and install the plastic center pins with the Phillips screwdriver. Note the center pins do NOT secure tight, just make sure the center pin seats. 12. 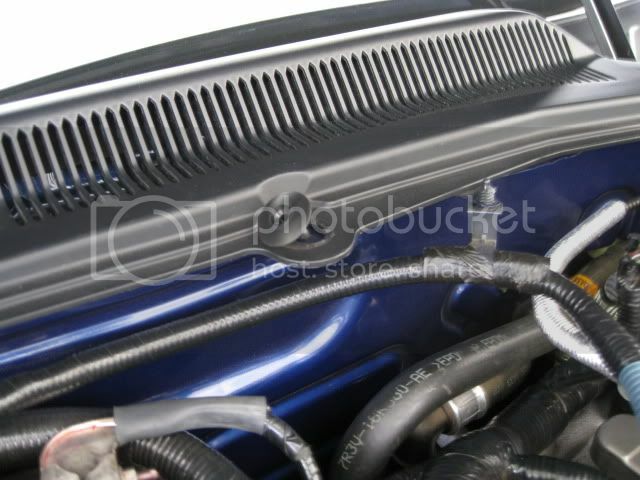 Close the hood and turn on the ignition to return the wipers to their stowed position. Last edited by 6-Speed; 01-09-11 at 09:04 AM. Nice detailed write-up ! I change mine every 10k, and its ALWAYS dirty! Purolator makes one(PepBoys) an Napa has one. 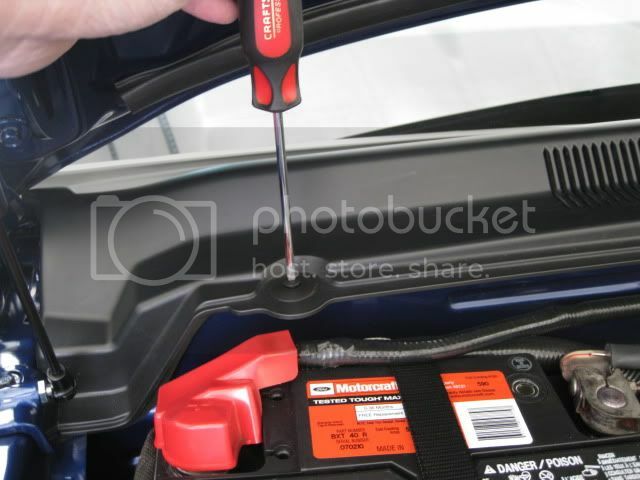 Everytime i went to Autozone or Checker ,they never had one in stock !